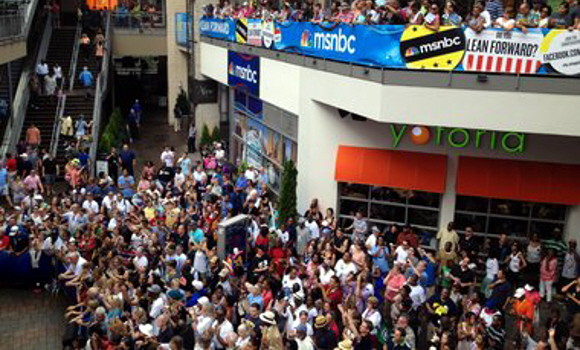 Without MSNBC where would all these people have gone. Anyhow, my trip to Charlotte was the completion of a journey I started back in August of 1968. I grew up in Barrington, Illinois (about 40 miles NW of downtown Chicago.) As a 16-year old hippie wannabe, I jumped in my 1966 VW Beetle along with three friends to join the protests at the 1968 Democratic Convention. In retrospect, we were fortunate that the cops told us to “Get back to the suburbs before you get into trouble.” That was the night of the Grant Park riots where “The whole world was watching.” So I headed off to Charlotte with lots of excitement and a bit of anxiety. As I approached Charlotte it became clear that at least $50 million had been spent on the thousands of police and extensive security infrastructure. There would be no trouble here (more on that in a future article.) I arrived around 10:00 am from Chapel Hill after navigating the security checkpoints and paying $25 to park my 2004 Buick Rendevous. 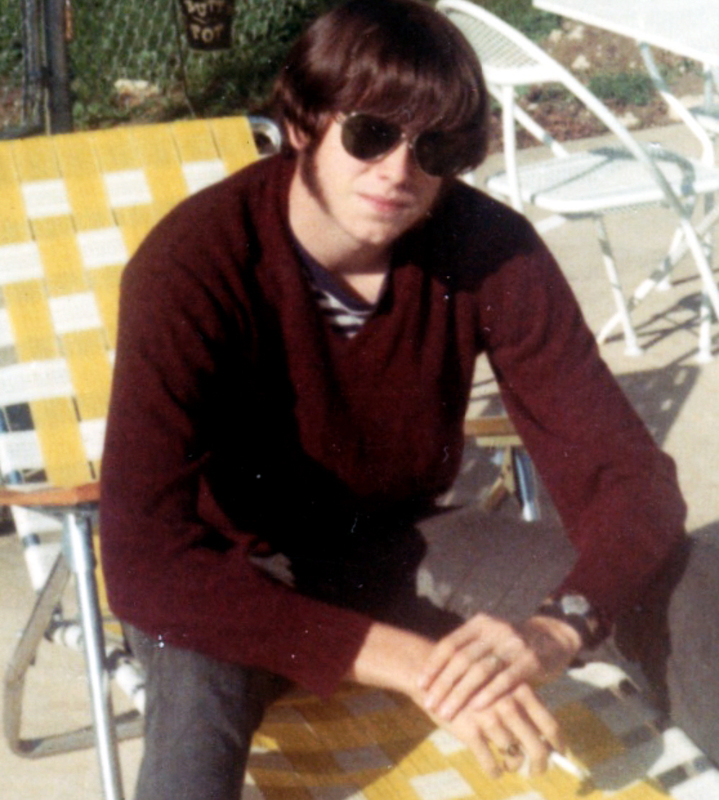 Yours Truly at age 16 in 1968. Radical and ready to rumble with shades, smokes and sideburns. The tension level on the streets was high so I asked for directions and parked quickly – about six blocks from my destination (the MSNBC experience at Epicentre.) The Experience was an ideal location in the hub of a modern entertainment complex featuring many bars and restaurants (that were unfortunately all closed to the uninvited like me.) It was really close to the Charlotte Bobcat’s basketball arena (a.k.a The Time Warner Arena.) This made it a lively community center where just about everyone was likely to visit at some time (except the biggest players.) In a short time I was able to see a number of political leaders and MSNBC journalists (who were generally happy to interact with fans and friends.) I was also fortunate to get there early enough to chill out in the experience sipping free iced coffee and collecting buttons. I do acknowledge that about half the pictures in this article are from the MSNBC Facebook Page. During the day I circulated throughout downtown Charlotte. I was able to shoot over two hours of video covering the extensive (extreme) police presence. This included the peaceful protest marches and the amazing dancing sheriffs from Clayton County, Georgia. I am preparing videos that will be published soon. Anyhow, I was so grateful to have the MSNBC Experience to return to throughout the day. I even had one close encounter that was important to me. At the back of the stage, guests and journalists would wait to join the broadcast. Before noon I saw Melissa Harris-Perry talking and posing with some fans. I introduced myself and said I would attend her book signing at 1:00. Unfortunately for me (but fortunately for her) I was too late as a huge crowd had formed. However, all is well that ends well. I am leaving shortly for Wake Forest University in Winston-Salem, NC where Melissa is holding a book signing and giving a lecture at her Alma mater. UPDATE: On Monday, May 10 I did meet Melissa and she signed my copy of her very impressive book at Wake Forest University in Winston Salem, NC. She then spoke to over 1000 freshmen, faculty and others from the pulpit of an awesome Chapel. One minute she was the serious scholar talking about political power; and the next she was once-again a 16 year old freshman at WFU. She offered sage advice for success in college and life. She did very well with a couple students who had questions about something she had written ten years earlier. She did comment on how she hadn’t slept in three weeks. I hope she is resting well in New Orleans. What an inspiration to the younger generation!! Melissa Harris-Perry Listens Intently During Break in Show. Chris Matthews is another person I had hoped to connect with. I did not meet him but did manage to get a note to him through a helpful stage manager. 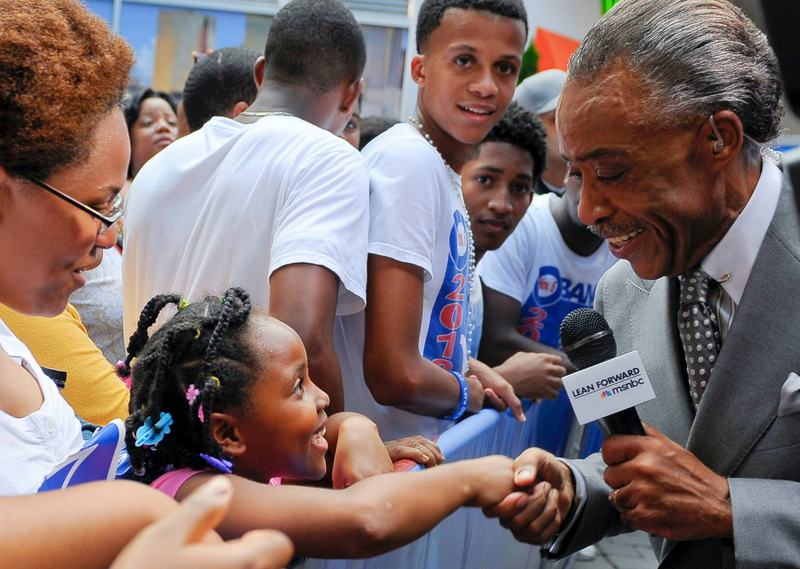 As you will see in the following pictures he was truly the Grand Marshall of the MSNBC experience. He also commented often on air about how much he appreciated the energy, excitement and enthusiasm in Charlotte (especially compared to Tampa Bay.) I agree with that assessment and feel that Charlotte displayed the Southern Hospitality we are known for in the Carolinas. 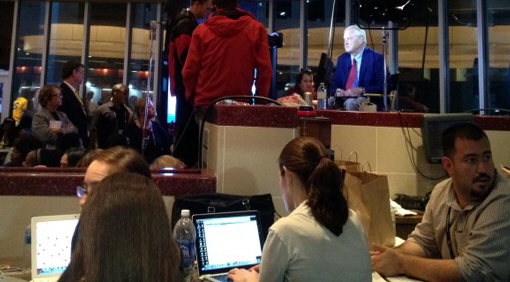 However, MSNBC was the main host for those of us who were not credentialed. In retrospect, I should have gotten credentials as a journalist. Such is the downside of living a spontaneous life that focuses intently on the moment! Here is the schedule that shows how well MSNBC integrated its extensive broadcast coverage with the MSNBC experience. In my opinion as a journalist for three decades (MS – Univ. Wisconsin – 1981) this coverage and the innovative experience sets the standard for all future coverage of live events – both political and cultural. In particular, their roster of talent is second to none in the news business. They had every angle and place covered during the entire DNC convention. Rachel Maddow anchored the entire coverage and hosted a great panel each night (details below.) She kept things moving well – like a conductor leading a symphony. She can “think on her feet” as well as anyone. 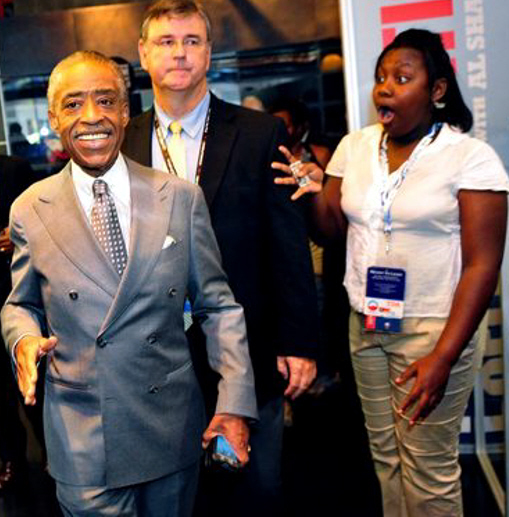 Viewers were also fortunate that MSNBC put the “A-team” on the convention floor. Andrea Mitchell, Chuck Todd, and Lawrence O’Donnell were able to get the best and biggest people for interviews. For example, Lawrence got one of the only TV interviews given by former SNL member, and now Senator Al Franken. Kudos! The camera crew and editing folks did a top-notch job capturing and combining crowd reaction, the best speeches, and live videos. MSNBC chose to show us some of the most important speeches that were not likely shown elsewhere. My favorites (above the non-politicians) were the Sister Campbell from Nuns on the Bus, Sandra Fluke, some Union members, and other real people talking about health care, Bain, and so on. The DNC-produced videos were helpful and offered a nice break in the speeches. Overall, the MSNBC people were very helpful with interpretation and insight. “Way too Early with Willie Geist” (5:30 a.m. – 6:00 a.m. ET) and “Morning Joe” (6:00 a.m. – 9:00 a.m. ET) were live from BlackFinn restaurant at the EpiCentre from September 4 – 7. The restaurant will be open to the public during the live show. Chuck Todd hosted “Daily Rundown” (9:00-10:00 a.m. ET) and Andrea Mitchell hosted “Andrea Mitchell Reports” (1:00 – 2:00 p.m. ET) from inside the Time Warner Area. Chuck, Andrea, and other hosts including Steve Kornacki, contributed live reports throughout the day for MSNBC from Charlotte. 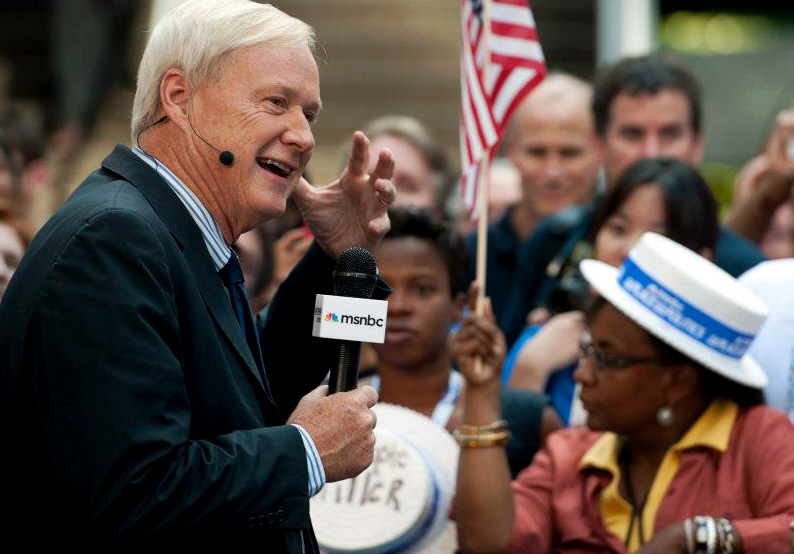 “Hardball with Chris Matthews” was live at 5 p.m. ET from an outdoor set in the courtyard at the EpiCentre. Special primetime coverage of the conventions was live from 7 p.m. – 1 a.m. ET September 4-6. Primetime coverage was hosted by Rachel Maddow with Chris Matthews joined by Ed Schultz, Lawrence O’Donnell, Rev. 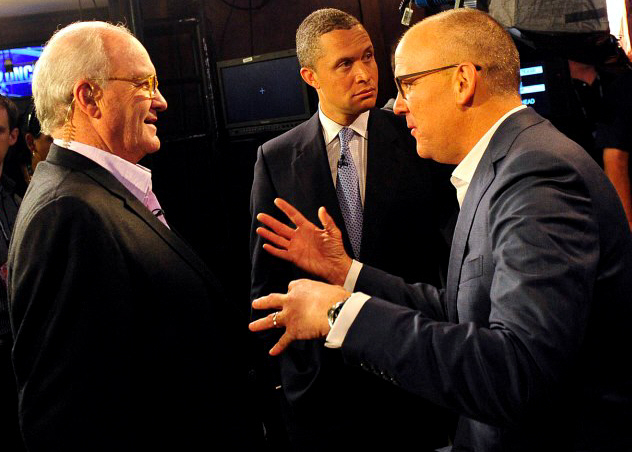 Al Sharpton, Chris Hayes and campaign strategist Steve Schmidt. Contributors included Alex Wagner, Melissa Harris-Perry, Former RNC chairman Michael Steele, Washington Post’s Ezra Klein, Huffington Post’s Howard Fineman, Frm. Gov. Ed Rendell, and Washington Post columnist Eugene Robinson. 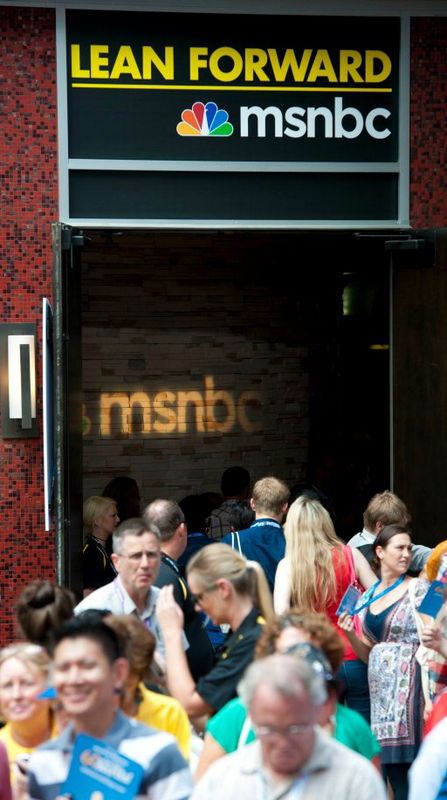 In Charlotte, MSNBC presented an interactive consumer experience from September 4-6 located at Enso restaurant in the EpiCentre courtyard. 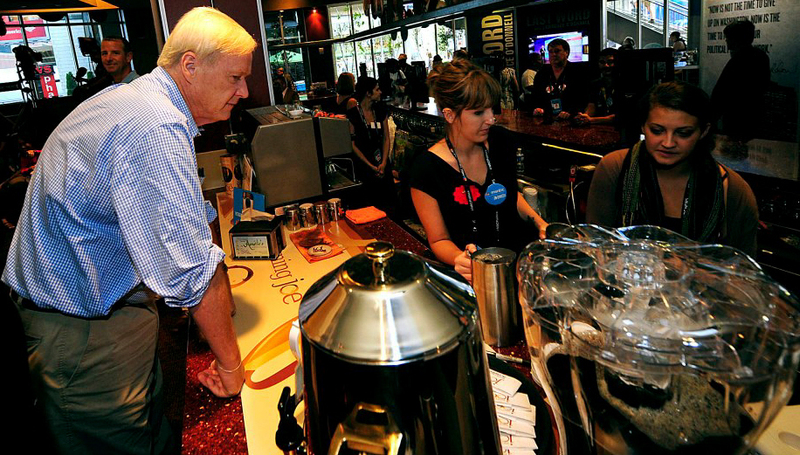 Fans were able to attend daily “Morning Joe” and primetime viewing parties, meet and greets with MSNBC stars. Visitors also took advantage of personalized souvenir button-making, photo booths, show giveaways, refreshments, charging stations, free wi-fi, and clean restrooms. 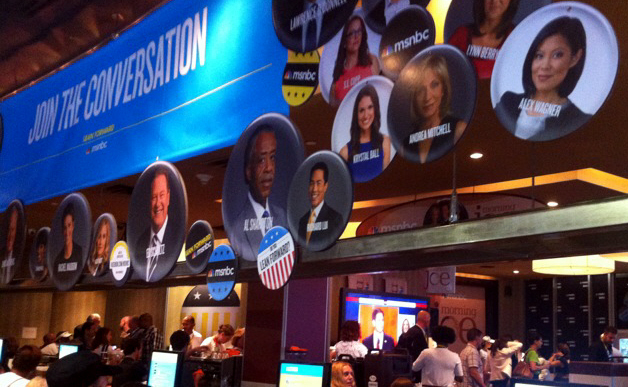 There was also an interactive social media component, allowing visitors and viewers to join in the MSNBC conversation. 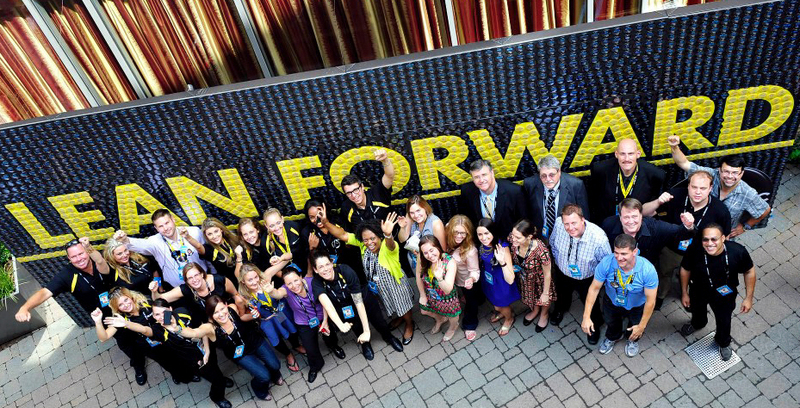 Full programming schedules including chats with talent and producers, behind the scenes viewing events, and interactive photo booth features were posted daily on the conventions tab at the MSNBC Facebook Page. 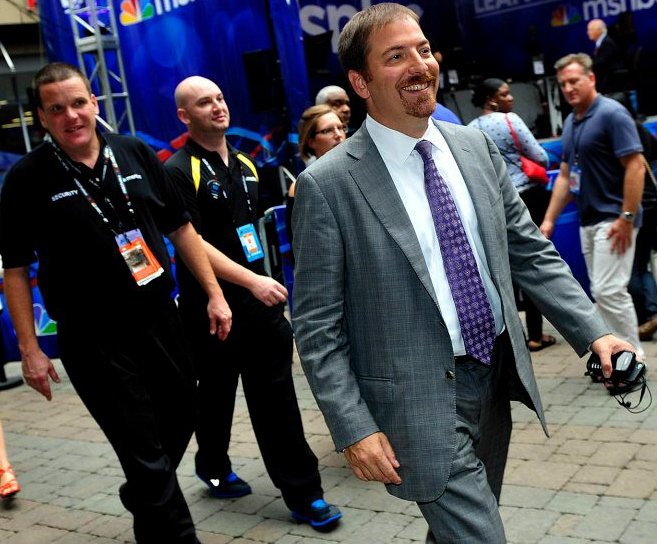 News Director Chuck Todd Smiling and Strolling along. I barely missed him twice. CHARLOTTE, N.C. — MSNBC president Phil Griffin is a happy man. On Wednesday afternoon, Griffin learned that MSNBC was the top-rated cable network for the opening night of the Democratic National Convention, a first in its 16-year history and a validation of the network’s progressive shift in recent years. Griffin spoke Wednesday from the MSNBC Experience in Charlotte, where fans of the network had just lined up for a book-signing with Melissa Harris-Perry, taken part in a Google+ chat with Ed Schultz and gawked as Chris Matthews made his way to an outdoor set. 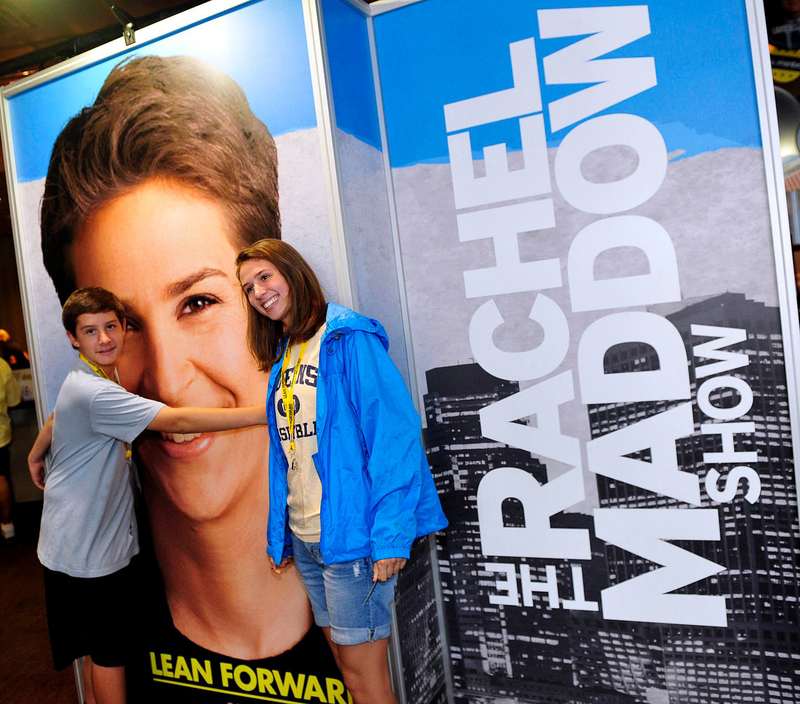 Inside the MSNBC Experience, fans grabbed buttons with personalities like Rachel Maddow and Lawrence O’Donnell and a few posed next to a huge picture of Al Sharpton. 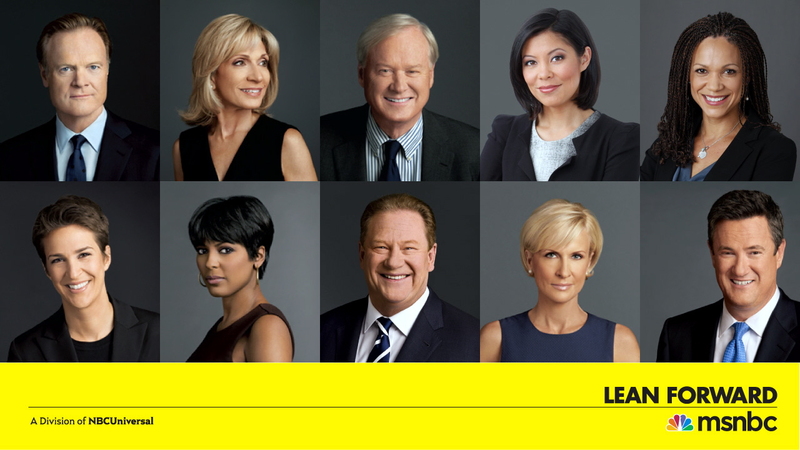 With the exception of Matthews, the aforementioned hosts didn’t have their own shows this time four years ago — and neither did Chris Hayes, Alex Wagner or Martin Bashir. Back then, the network’s biggest star was Keith Olbermann, who has since joined and left Current TV. 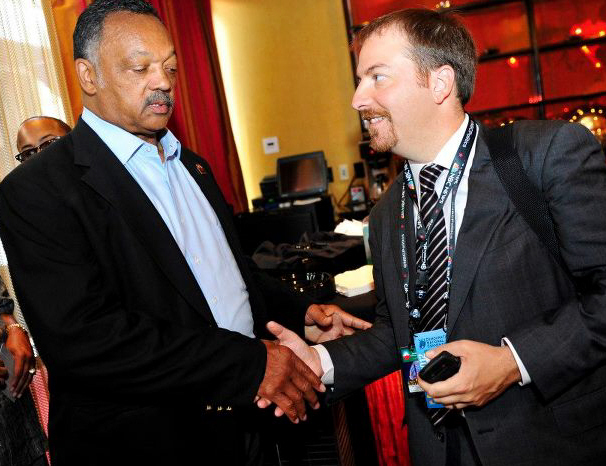 MSNBC came in first Tuesday night in both total viewers (4.107 million) and in the 18-49 demographic (1.432 million). CNN ranked second (3.88 and 1.368 million), with Fox News — the dominant cable news network and the big winner during the Republican National Convention — coming in third (2.398 and 550,000 million). 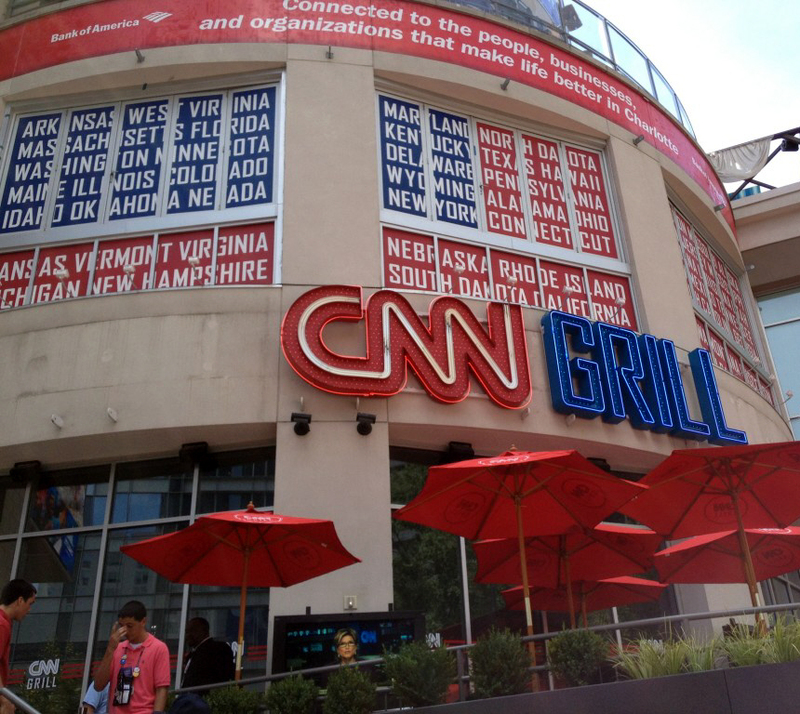 CNN Grill was Armed Fortress – Never open to the public. MSNBC celebrated a major milestone on Wednesday when it topped its rivals in primetime convention ratings for the first time in its 16-year history. An MSNBC spokesperson confirmed that it was the network’s first-ever convention victory, and the first time that it beat its rivals head-to-head while all three were covering the same political event. 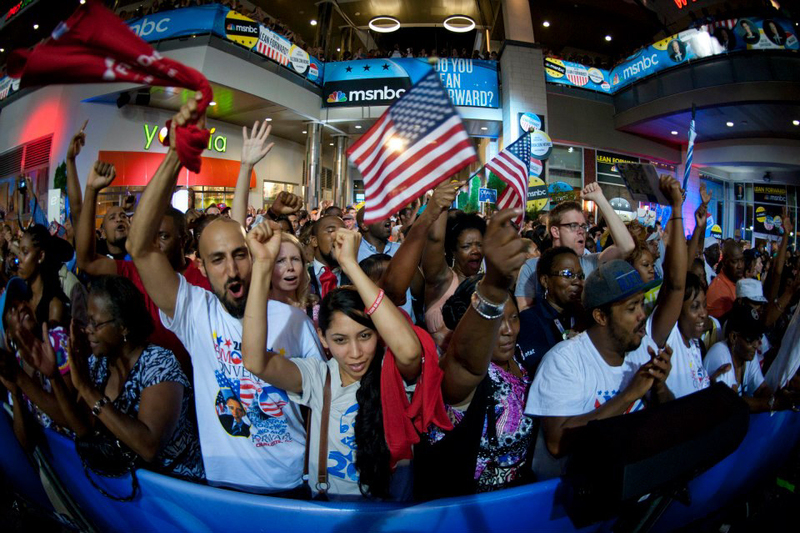 MSNBC’s victory came on the first night of the Democratic convention in Charlotte. The network was first in both total viewers (4.107 million) and in the coveted 18-49 demo (1.432 million.) CNN came in second, with 3.88 million and 1.368 million in both categories. Fox News trailed far behind, drawing just 2.398 million total viewers and 550,000 in the demo — a far cry from its ratings on the first night of the Republican convention, when it drew a whopping 6.87 million viewers. MSNBC was also the only channel to grow its ratings from 2008. All of the other networks saw their ratings drop sharply. 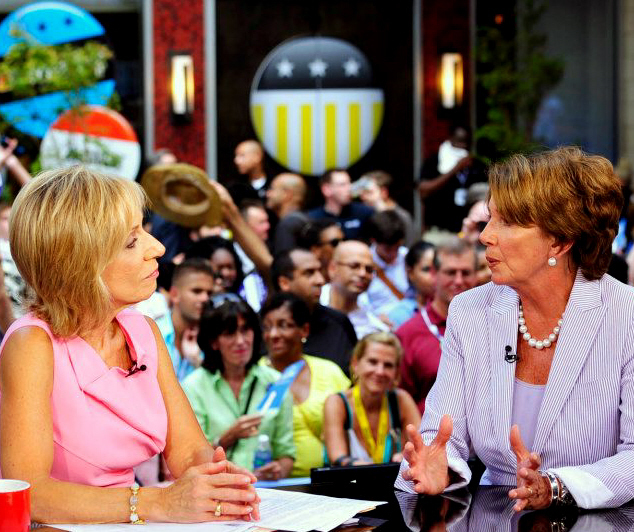 The disparity between MSNBC and Fox News could be chalked up to simple partisanship. Democrats are more likely to watch MSNBC during the Democratic gathering, and Republicans are more likely to watch Fox News during the Republican gathering — and to stay away from watching the DNC altogether. But it’s also a reflection of the success MSNBC has had in solidifying its brand as the go-to network for progressive and Democratic viewers. 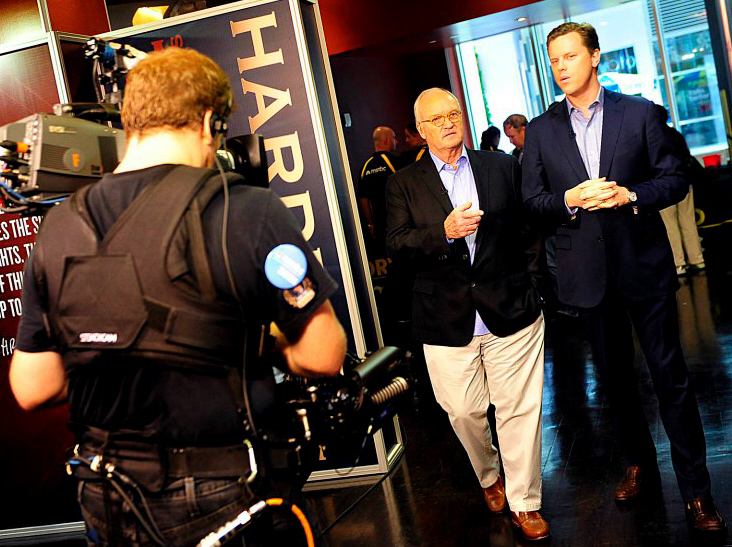 MSNBC president Phil Griffin reacted to the news at the MSNBC Experience center in Charlotte. White House Spokesperson Valerie Jarrett with MSNBC’s Tom Brokaw and Mika Brzezinski during Break in Morning Joe Action. NOTE: The following two articles are from two traditional print media (NY Times and Washington Post) who used to “rule the roost.” It is easy to note a good deal of jealousy and overall snarkiness in their opinion pieces. Sure, the events here in Charlotte are a national celebration of the Democratic Party and its presidential nominee. But in many ways, it’s the MSNBC Convention. Network, party and partisan moment have collided, felicitously, in Charlotte. 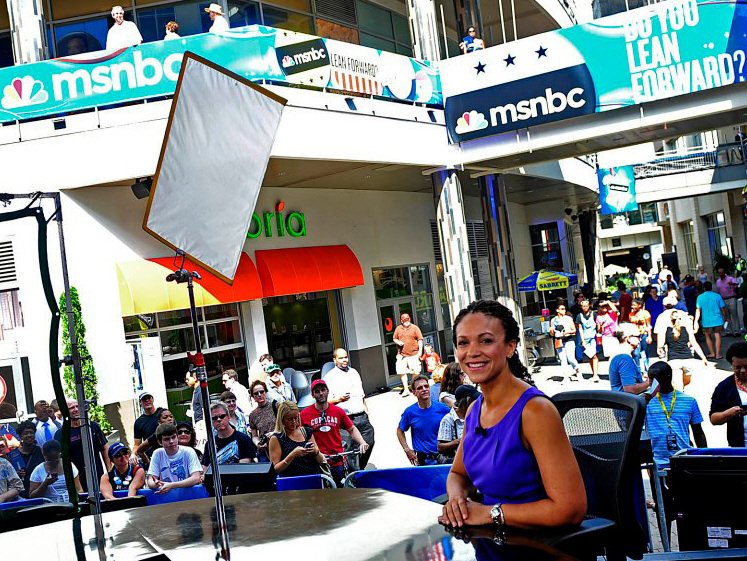 MSNBC’s on-air personalities are mobbed in the street, snarling pedestrian traffic. Its network-branded pins, coffee cups and tote bags are ubiquitous collectors’ items for delegates. Its promotional posters and banners are so ostentatious that Willie Geist, an MSNBC host, has compared them to North Korean propaganda. 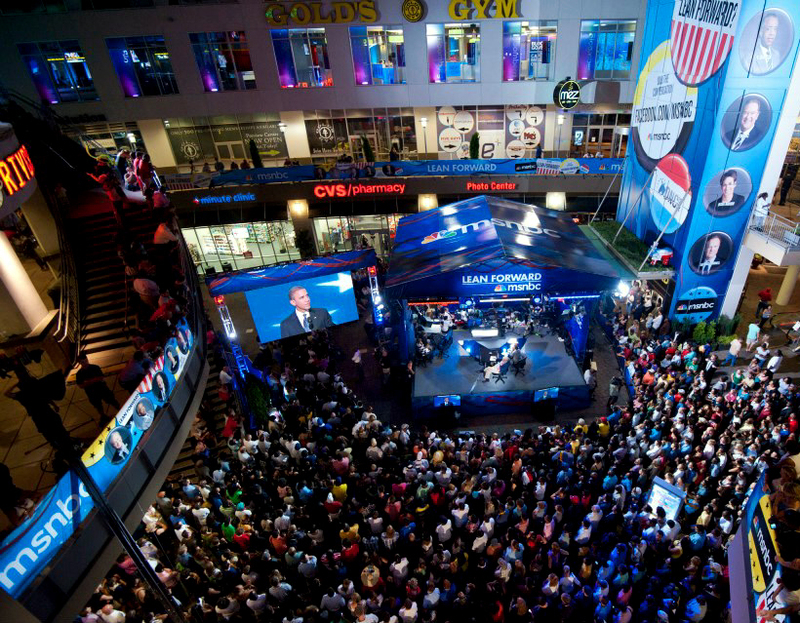 Inside the MSNBC Plaza, a sprawling open-air studio decked out with a cafe, lounge and “MSNBC Experience” center, the crowds seem large enough to hold their own convention. 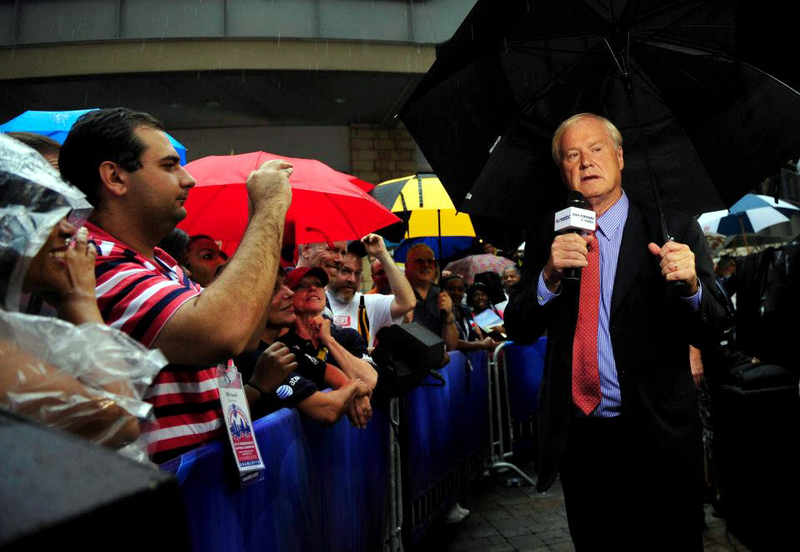 A few nights ago, torrential rains swept through Charlotte as Chris Matthews began taping “Hardball” in the plaza. Five hundred conventiongoers stood there anyway, soaking wet. The adoration does not end once the networks stars leave the street. When Mr. Scarborough and Ms. Brzezinski, below, sat down to dinner on Monday night at Morton’s, they were greeted with a free bottle of pink Veuve Clicquot Champagne. A fan had sent it over. They came, they were adored, they conquered. No, not the president, his family or the numerous actors and political heirs who spoke glowingly of Barack Obama during the Democratic National Convention. I’m talking about the media — and especially MSNBC, whose presence and influence in Charlotte were nearly as grand as the president’s. No one pretends anymore that MSNBC is an objective observer to the news. Obviously, the decision was made to be aggressively progressive. With the exception of “Morning Joe,” where Joe Scarborough and Mika Brzezinski co-host a roundtable of commentators, politicos and actors who dispense praise and criticism equally to Democrats and Republicans, the cable network’s other political shows are unapologetically pro-Democratic, pro-Obama. That television personalities are also celebrities is, alas, unavoidable. We naturally feel a bond with people who are in our kitchens and living rooms every day. Producers count on this connection. What is not counted on by casual consumers is the merging of a television personality’s politics and the viewer’s understanding of the world. The blending of news and opinion isn’t new, but activism posing as journalism is. While some viewers may be savvy enough to understand the difference and choose their medicine accordingly, many are not.